SACEVS Best Value paired with SACEMS Top 1 (aggressive value and aggressive momentum). 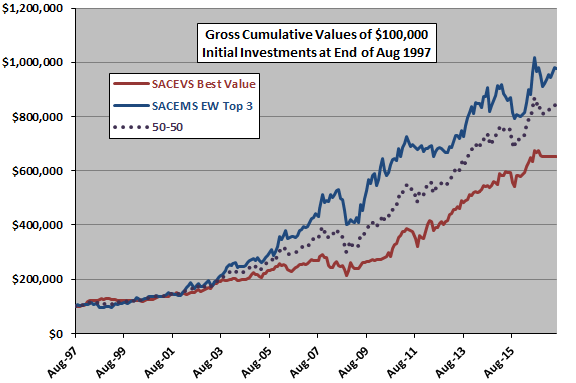 SACEVS Best Value paired with SACEMS Equally Weighted (EW) Top 3 (aggressive value and diversified momentum). SACEVS Weighted paired with SACEMS EW Top 3 (diversified value and diversified momentum). First, we look at SACEVS Best Value-SACEMS Top 1, aggressive with both value and momentum. The correlation of monthly returns between these strategies over the available sample period is 0.12, indicating that they substantially diversify each other. Average gross monthly returns (standard deviations of monthly returns) for SACEVS Best Value, SACEMS Top 1 and 50-50 are 0.8% (3.2%), 1.1% (6.5%) and 1.0% (3.8%), respectively, translating to rough monthly Sharpe ratios of 0.27, 0.17 and 0.26. Compound annual growth rates (CAGR) are 9.9%, 11.5% and 11.5%, respectively. Maximum drawdowns (MaxDD) based on monthly data are -26%, -33% and -23%, respectively. For another perspective, we look at calendar year returns. 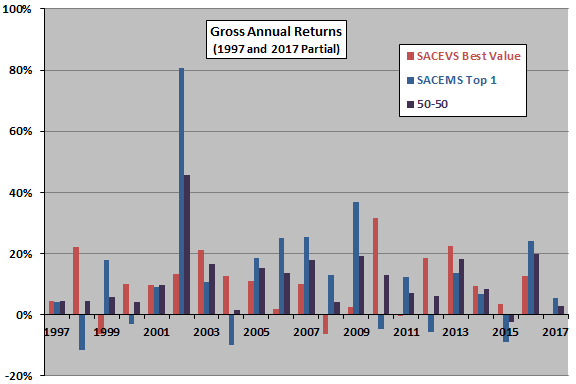 The next chart summarizes gross annual returns for each of SACEVS Best Value, SACEMS Top 1 and 50-50 during 1997 through 2017, with 1997 and 2017 partial. Average annual returns (standard deviations of annual returns) for 1998 through 2016 are 10.2% (9.8%), 12.7% (20.9%) and 11.6% (10.3%), respectively, translating to rough annual Sharpe ratios 1.0, 0.6 and 1.1. Only 2015 has a negative return for the 50-50 strategy. Next, we look at SACEVS Best Value-SACEMS EW Top 3, aggressive with value but cautious with momentum. The correlation of monthly returns between SACEVS Best Value and SACEMS EW Top 3 over the available sample period is 0.36, indicating that they materially diversify each other. Average gross monthly returns (standard deviations of monthly returns) for SACEVS Best Value, SACEMS EW Top 3 and 50-50 are 0.8% (3.2%), 1.0% (4.0%) and 0.9% (3.0%), respectively, translating to rough monthly Sharpe ratios of 0.27, 0.26 and 0.32. CAGRs are 9.9%, 12.2% and 11.3%, respectively. MaxDDs based on monthly data are -26%, -24% and -24%, respectively. 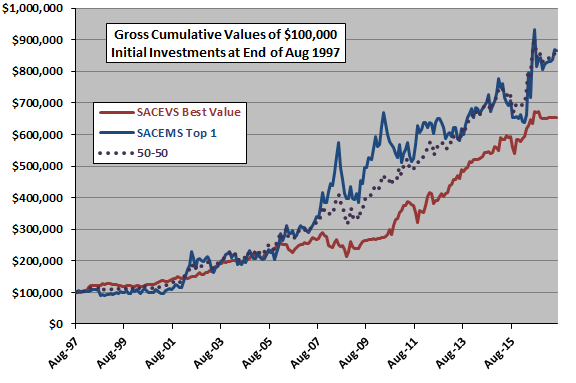 The next chart summarizes gross annual returns for each of SACEVS Best Value, SACEMS EW Top 3 and 50-50 over the available sample period, with 1997 and 2017 partial. Average annual returns (standard deviations of annual returns) for 1998 through 2016 are 10.2% (9.8%), 12.8% (15.6%) and 11.5% (9.9%), respectively, translating to rough annual Sharpe ratios 1.0, 0.8 and 1.2. 2008 and 2015 have negative returns for the 50-50 strategy. 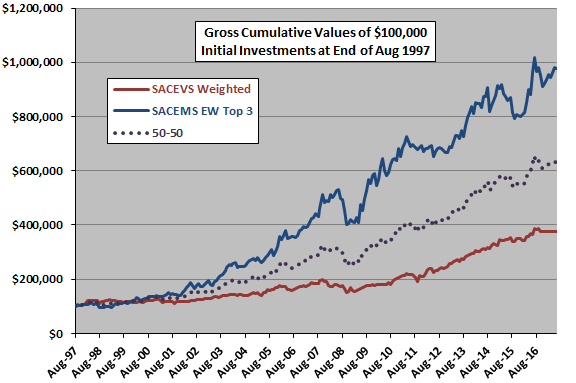 Finally, we look at SACEVS Weighted-SACEMS EW Top 3, cautious with both value and momentum. 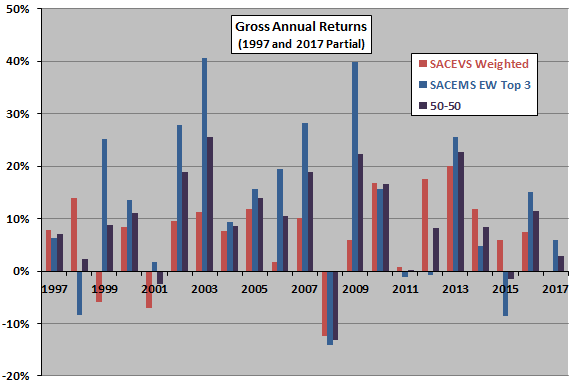 The correlation of monthly returns between SACEVS Weighted and SACEMS EW Top 3 over the available sample period is 0.40, indicating that they materially diversify each other. Average gross monthly returns (standard deviations of monthly returns) for SACEVS Weighted, SACEMS EW Top 3 and 50-50 are 0.6% (2.8%), 1.0% (4.0%) and 0.8% (2.9%), respectively, translating to rough monthly Sharpe ratios 0.22, 0.26 and 0.29. CAGRs are 6.9%, 12.2% and 9.7%, respectively. MaxDDs based on monthly data are -25%, -24% and -23%, respectively. 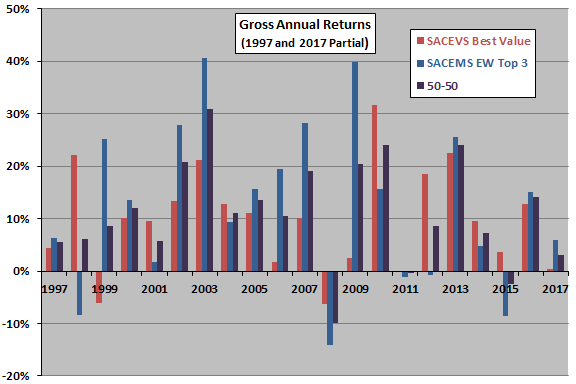 The final chart summarizes gross annual returns for each of SACEVS Weighted, SACEMS EW Top 3 and 50-50 over the available sample period, with 1997 and 2017 partial. Average annual returns (standard deviations of annual returns) for 1998-2016 are 7.1% (8.3%), 12.8% (15.6%) and 9.9% (9.7%), respectively, translating to rough annual Sharpe ratios of 0.9, 0.8 and 1.0. 2001, 2008 and 2015 have negative returns for the 50-50 strategy. The following table summarizes some key gross annual performance statistics for the SACEVS-SACEMS diversified portfolios over the available full-year sample period. Results suggest the three approaches are comparable on a reward-for-risk basis. In summary, evidence from the available sample period suggests that SACEMS and SACEVS as applied to mutual funds usefully diversify each other. Analyses ignore any costs/constraints (mutual fund loads and penalties for early withdrawals) associated with the base strategies and with rebalancing the 50-50 combination each month. Constraints may be stronger for diversified versions of SACEVS and SACEMS pair than for the aggressive versions. Available sample periods are modest for analysis of annual returns. Cautions outlined in “SACEVS Applied to Mutual Funds” and “SACEMS Applied to Mutual Funds” also apply. Why not subscribe to our premium content? It costs less than a single trading commission. Learn more here.